The American artist Frederic Remington, is best known to have captured the true spirit of the American West in his fine paintings and highly individual and powerful sculptures. But he was a commercially minded artist and subsequently saw reproduced his sculptures in bronze as limited editions, specifically using two foundries: Henry-Bonnard Bronze Co. and Roman Bronze Works. Alas with his success, he was and is widely faked with illicit unauthorised reproductions littering the art market today. So it is something of a nightmare for the general public to truly know exactly what they have. Renown internationally as leading experts in our field, the Freemanart Consultancy confidentially conduct all of the investigative processes, academic and archival studies, along with any forensic applications required in the difficult field of art authentication. This includes, expert in-depth study and international archival research, state of the art forensic analysis, and each set alongside comprehensive scrutiny of the background, history and provenance of the work of art. 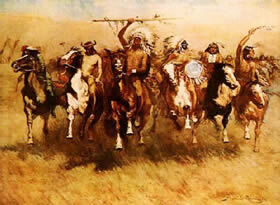 The question is this: Is it a real work of art by Frederic Remington you have tucked away that a relative swore was right? Or is it another early mistake made by art experts who thought it was a Remington,but got it very wrong by today's standards. Something now considered to be just painted or made just in his style and manner by a follower? The problem is, it could always actually be a down and out fake Remington you have too, there were and still are lots out there, claiming they are real. Well you won't know till you do know and you can't do that stuck behind a desk somewhere and certainly not by looking in a book or trawling the internet till you fall to sleep with fatigue. So take advise from those who specialise in authentication investigations and research before you start investing a lot of money on what could be a wild goose chase. 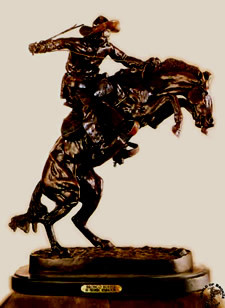 Before entering into a full investigation of the legitimacy of a work of art you believe may be by Frederic Remington, be it simply academic, forensic or as with most cases, both forms of investigation, it is essential to know if the project is viable in the long term and more importantly, that it is possibly provable. Much as you would need to know if you stood any chance of winning if you were considering taking a legal case to court. Logically, if it is not, you shouldn't even attempt it, because the risk of failure is far too great. So at the Freemanart Consultancy, with 44 years now of international experience in fine art investigations behind us, we prefer to make a preliminary, totally independent, unbiased and vital professional pre authentication assessment for our clients first. This is based upon the images you supply and the full details of the work of art's history and provenance. This is a logical and cost effective professional assessment and advisory for which there is a modest set fee. Then you'll know exactly where you stand. Art Authentication & Investigations into the authenticity and legitimacy of international fine art for clients. Including all Old & Modern Masters. The Freemanart Consultancy's vast international experience in processing art authentication and attribution investigations of fine art, includes all genres, artists and covers centuries from Medieval times to the present. Authentication: Investigating and establishing an internationally accepted and fully recognised accreditation of a work of art. Specifically those art works with a signature claim, firm belief, as well as those well evidenced or holding an earlier qualification of legitimacy. We are specifically here to assist you with all Frederic Remington art authentication issues, investigations and research. Frederic Remington - Art authentication investigators, research and investigation experts- Identification of Remington fakes and Remington forgeries and attributions, . Expert de Remington- Painting authentification services.